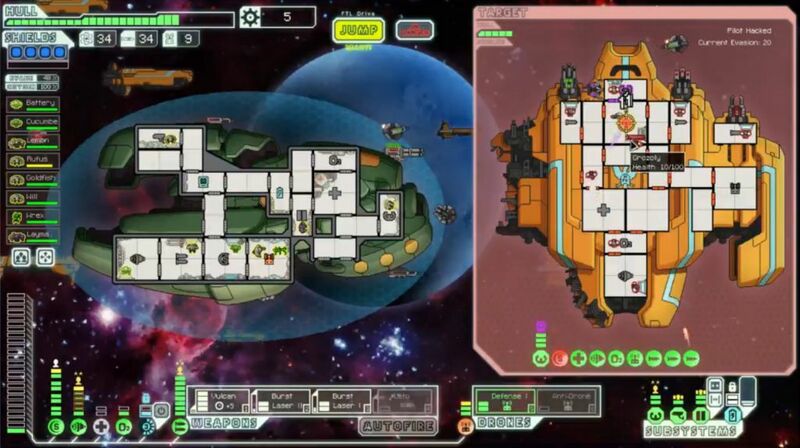 This is another new ship layout from FTL, the default "A" version of the Zoltan Cruiser. Zoltans are sort of the economic race in FTL, fragile in any kind of straight up combat while providing free reactor power to systems. They are the most expensive race to hire in stores, and they work especially well when placed in the engine room or shield room of ships. (The weapons room not so much, since any movement out of the room tends to depower weapons, and that's not a good thing in mid-battle!) The Zoltan Cruiser reflects the ethos of this energy-based race of beings. All three Zoltan ship layouts have a starting Zoltan Shield augment, something unique only to these ships. This provides five free shield barriers at the start of each fight that block all damage until they are taken down, and they do not regenerate after taking damage. The Zoltan supershield will block missiles (unlike normal shields) and stop enemy attempts at hacking, mind control, or beaming over with a teleporter. You are essentially invincible so long as those five points of shielding hold. Zoltan ships have a major incentive to win battles quickly, since their ships become vastly weaker once the Zoltan Shield has been broken. The particular design of the Zoltan A comes with excellent weaponry in tow. The Halberd Beam is enough to carry your crew through the first two sectors with ease, and it pairs well with virtually any laser or ion weapon that might happen to turn up. It's one of my favorite weapons in the game. The Leto missiles are much weaker, but it's always nice to have another source of damage, even without much synergy between the Letos and the Halberd. Note however that the ship begins with only level 3 weapons, so it is not possible to use both the Halberd and the Letos at the same time when starting out. This ship begins the game with three Zoltan crewmembers, which is very nice indeed even if one of them will have to pilot the ship and therefore waste the passive reactor power racial bonus. The designers of this ship were even kind enough to start you off with level 2 doors, as a way to handle invaders after the Zoltan shield is down. You'll need it too, since there's little choice other than opening up the hatches and draining the ship of oxygen to cope with enemy boarders. Zoltans are terribly fragile in melee combat with their 70 health. On the downside, the Zoltan A starts with the bare minimum of level 1 engines, and only five power in the starting reactor. (All of the Zoltan ships have low initial reactor power to offset their innate racial bonus.) Fortunately both of these issues can be overcome with additional upgrades, and they fit the theme of this race very well. Overall the Zoltan A easily classifies as one of the best ships in FTL, and it's one that can win the game without needing much in the way of good luck. This is one of my favorite ships to use, since you can play around with power management and do lots of little micro tricks. (So long as the Zoltan shield is up, there's no need to power standard shields at all - put all the power into the engines and more dodge chance!) A fun ship indeed. My first two attempts to use the Zoltan A on stream ran into various strange obstacles. The first voyage had arguably the worst weapons luck I've ever seen. I couldn't find a single weapon in the first three sectors, not one through a random event or a weapon in a store. Seriously, the first three stores all had zero weapons for sale! Never seen that before. I managed to get Swarm Missiles eventually, and I was desperately trying to make this combination of Leto and Swarm missiles work against ships that had level 4 and level 6 shields. It was just impossible, I reached a point where I simply could not damage the enemy ship designs. Where were all of the lasers?! The second attempt was doing extremely well and looked like a certain victory, only to run into the autoscout from hell at the beginning of Sector Six. I ran into this ship in an asteroid field, and it was sporting a Burst II Laser, a Heavy Laser, a fast-firing Ion weapon, and level six shields (three bubbles) with high evade. My ship had absolutely no chance, and it was shredded from full health down to nothing in mere seconds. The autoscout knocked out my piloting (and weapons... and shields...) right away, leaving no chance to jump away from the beacon. What a nasty bit of RNG. Only a Cloaking unit would have allowed me to survive long enough to run away, and that was something I didn't have. Well hello there, Mr. Glaive Beam! This is the highest tier beam weapon in the game, dealing 3 damage to all unshielded rooms and piercing through lower levels of shielding (2 damage if there's a single shield bubble present and 1 damage in the case of two shields). It's an awesome weapon and great for the lategame, although it comes with some serious costs as well: four weapon power to use and a massive 25 second chargeup time. That's the longest weapon cooldown in the entire game. For the moment, the Glaive Beam would be complete overkill, so I stashed it and continued to use the Halberd Beam. I would have to make a decision between them at some point, either one or the other. You can't really tie up seven weapon power in a pair of beam weapons! Zoltans always provide one power bar for the system in the room where they are standing, and this works regardless of ion damage. By pulling two zoltans over from the engine and weapons room, I've managed to provide two power into shields despite the ion pulse, and that's enough to run one layer of shields. This protected me from the enemy combat drone, and allowed me to survive this battle with minimal damage. Whew. You can use the same trick to power a Cloning Bay if it's been ionized and there's crew inside it reviving, or any other important system. This is a very handy thing to keep in mind. As for going on the offensive in these ion pulsar scenarios, try to time your volley to fire just as the first pulsar is going off. It will take out enemy shields just as your attack hits. In an ideal situation, you knock out the enemy weapons and your own lack of shields doesn't end up causing any problems. It's not always that clean, of course, and I try to avoid the pulsars if I have Long Range Scanners and can see them ahead of time. Too many good runs of mine have died to stupid random stuff in these events. Bah. By the end of Sector One, I had level 4 shields, level 4 engines, a free Glaive Beam and Emergency Respirators, a free rockman crewmember from a battle against slavers, and zero damage on the hull thanks to another friendly event that healed all missing health. This was a ridiculous start that put me far out in front of The Curve, and anything other than crazy bad luck or catastrophic errors should have been enough to see me through to victory. I purchased a Burst Laser I at a store in Sector Two, and that allowed me to progress smoothly on to higher levels of weapon tech. 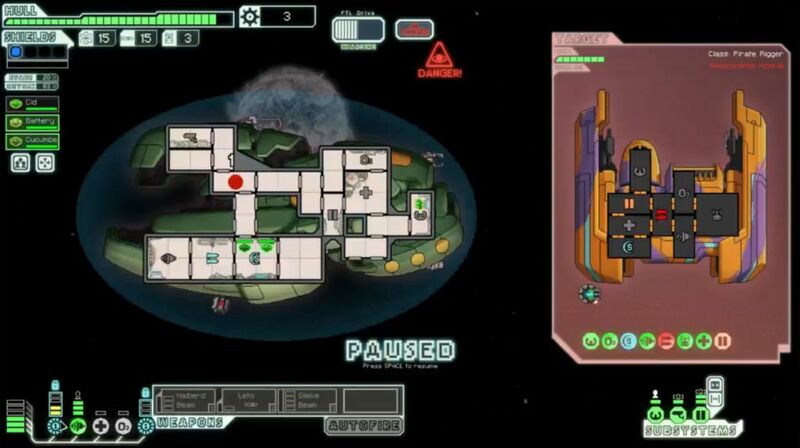 Just as the enemy ships began to appear with a second layer of shields (which the Halberd Beam wouldn't be able to penetrate), I managed to get the Halberd + Burst Laser combo in place, and it was back to easy street once again. I had to use the Glaive Beam for exactly one battle when weapons were only level 4, heh. Nearly perfect timing there. All the while I was picking up more crewmembers from events (ending up with tons of engi for some reason) and several free reactor upgrades in exchange for fuel/missiles/drones. 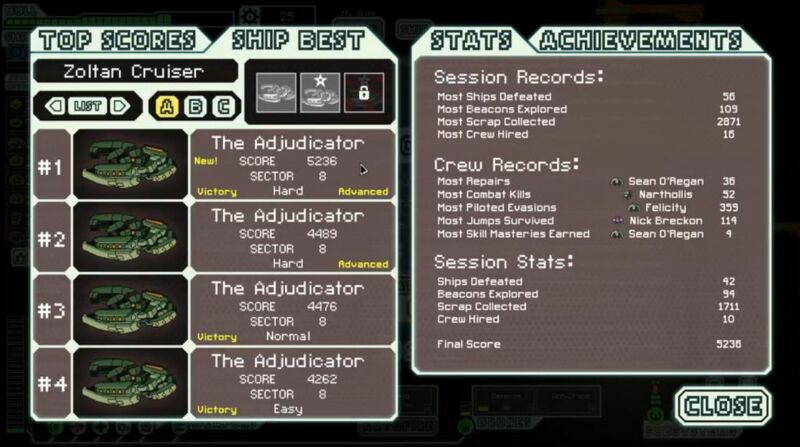 I even pulled a full sector scan in Sector Three and managed to hit six straight battles en route to the exit. Hardly any of the enemies could make it through the Zoltan shield - this was easy stuff. After much thought I ditched the more powerful but slower Glaive Beam in favor of the default starting Halberd Beam. The main reason why lay in the timing of the weapon's cooldowns. My lasers would be charged and ready to go in 11 seconds (Burst Laser I) and 14 seconds (Hull Beam). The Halberd Beam would be ready to fire shortly thereafter, with its 17 second cooldown. But if I were to use the Glaive Beam, I would be sitting around for ages waiting for the darned thing to fire with its gigantic 25 second chargeup time. This would waste much of the damage per second (DPS) from the laser weapons. The slow timing on the Glaive Beam would also leave my ship vulnerable to enemy attacks, since everything on the enemy ships would get a chance to fire before I could fire in turn. The Glaive Beam honestly needs something like a Cloaking unit (see the Stealth B ship, for example) or a slow-charging weapon like a Flak II to be used to maximum effectiveness. I didn't feel that I had the right setup here, and I stand by that decision. I know that some of the stream viewers were disappointed at not getting to see the Glaive Beam in action - sorry about that! I had to go with what I thought was the best choice. After that, the remaining sectors were fairly straightforward. I upgraded weapons to level 7 to get all of the lasers in play, and together with the Halberd Beam they had little trouble destroying the enemy ships. I even found a Burst Laser II for sale in a store, and replaced the Hull Laser with the far superior one. Five total shots for four power usage, awesome. More crew continued to sign up for the voyage; at one point I had two zoltans and four engis on board (having lost my zoltan pilot in a random event). What a weak bunch! We had to stay away from melee combat for sure. Eventually I would be able to pick up a mantis and a second rockman for some actual muscle in hand to hand fighting. I kept finding quests along the way, encountering three of them in Sector Five alone! Too bad I only had time to visit two of them before the rebels arrived. I also picked up a Defensive Drone for free in the aftermath of a battle, and wished that I could find a Drone Control system in a store to use it. Nearly all of the damage that I was taking came from missiles. In a single battle, I took 12 damage from three different Breach Missiles (four damage apiece) getting through. Argh, what a pain! A little bit closer than I would have liked, although I would have played the sector differently without that initial scan. The store allowed me to sell some useless stuff found along the way (Backup DNA Bank, Charge Ion, and Hermes Missile) and then purchase the awesome combination of Drone Control, Hacking, and Backup Battery. I had enough scrap to fix up the damaged hull too! The Drone Control eliminated my vulnerability to those irritating missiles, while Hacking allowed me to lock down enemy ships. Hack their piloting and their evade drops to zero, ensuring that every laser shot hits. Five shots take out the shields guaranteed every time, and then the Halberd Beam goes to work. 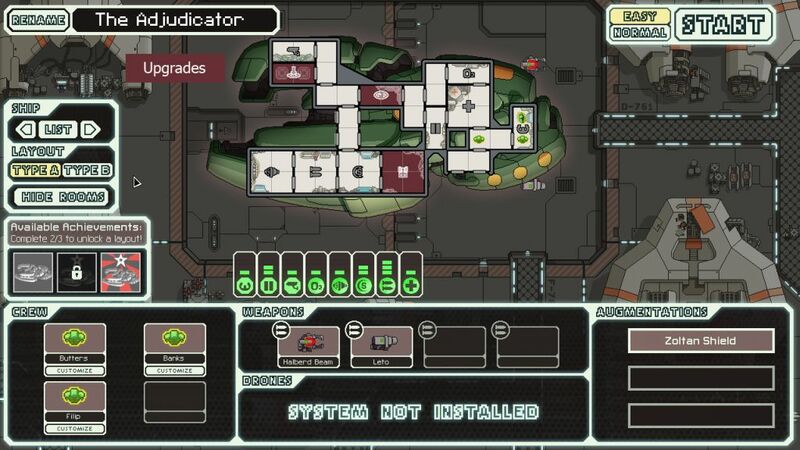 Hacking may have been even better than Cloaking for this particular setup, since it allowed me to kill enemy ships very quickly and eliminate them before my own Zoltan Shield could be broken. I searched for a Cloaking unit in Sectors Seven and Eight, but it was not to be. I was going to be using this setup for the rebel flagship. There isn't too much to say about the rest of the game leading up to the final boss. 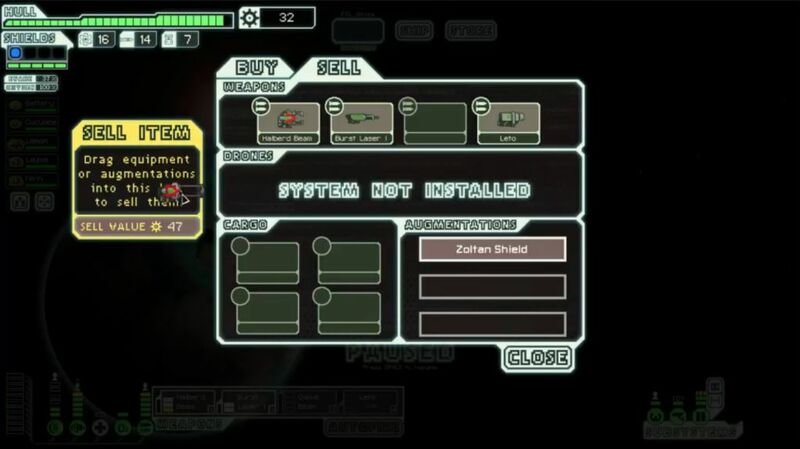 As if this run hadn't been disgusting enough already, I was offered a Vulcan weapon for free after another battle. My weapons setup was so good that I didn't even need to use the thing! I held it in storage for use against the rebel flagship. The random battles that I was encountering along the way were over too fast for the Vulcan's slow chargeup time to be cost effective. I upgraded to level 8 shields, level 6 engines (one more than I normally get), level 8 weapons, and all of the other standard goodies. 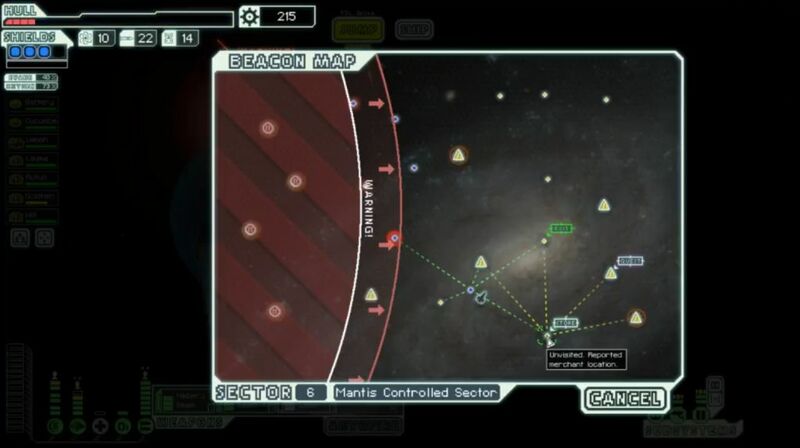 There was no need to try to farm additional scrap in Sector Eight, I headed straight to the base to fight the rebel flagship. It was time to finish off this voyage. 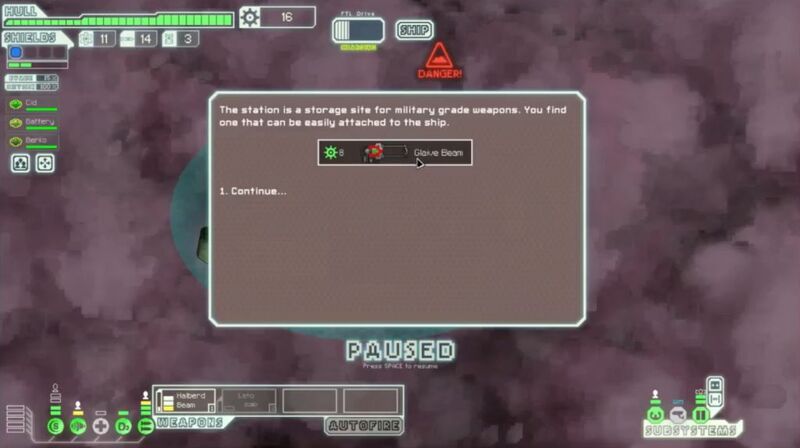 I kept standard weapon setup for the first phase of the flagship battle; I did not want to use the Vulcan because its ability to strip away enemy shields gets interrupted by Cloaking. I intended to use it for the final two phases of the fight. I went with the Halberd + Burst II + Burst I + Leto combination (Leto missiles, hah! Why not though.) Hacking worked like a charm here, with the first volley dropping two of the flagship's four shield bubbles and dealing eight damage to the hull. 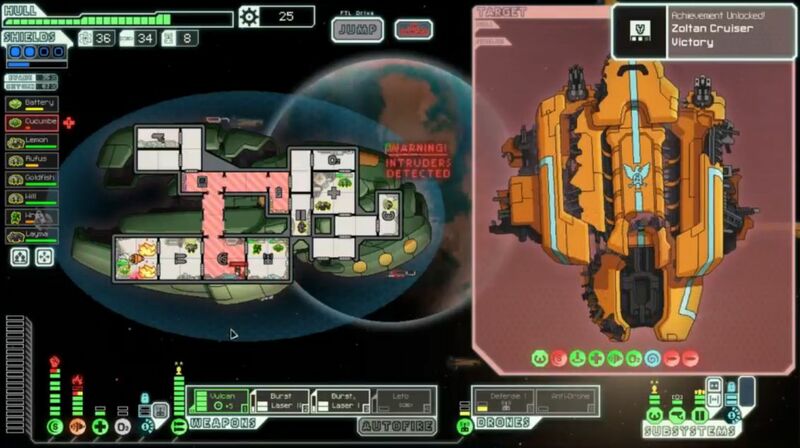 My Zoltan Shield prevented the flagship's own Hacking unit from hitting until it was down, although they picked a good target by hacking my own piloting in turn. At least it wasn't weapons or shields, the two worst targets. My second Hacking-enabled volley crashed into the rebel shield unit again, leaving the flagship with a single point of health. I thought that a Leto missile could get the kill here... but it missed. Heh. The flagship had only a single shield bubble intact, however, so I fired a five laser burst two seconds later and that put an end to the first phase. Only three damage taken, an excellent round. For the second drone phase of the battle, I swapped out the Halberd Beam for the Vulcan, bidding adieu to the Leto missiles in the process. I also powered up the Antidrone that I'd purchased earlier in the game, which always seems to work well here. My Defensive Drone kept the flagship's boarding drones from landing, shooting them all down without letting a single one through. Good work there, I've seen the first one get through too many times despite a defensive drone's presence. I survived the enemy missile volleys and the first drone surge without too much trouble while waiting for the Vulcan to charge itself up. My first Hacking-boosted volley didn't do all the much. The second one, aided now by the Vulcan with five stacks, ripped apart the shield room and left the flagship completely undefended. I killed two enemy crew with the next volley, and the Vulcan continued relentlessly chewing through the rest of the hull. The rebels never managed to get off a second drone surge. I took exactly one point of damage in this final phase of the flagship battle, my best ever for a ship without a Cloaking unit. That one point of damage came from the second laser surge, where a single shot got through and hit the engine room (currently on fire in the picture above). Some of this was good luck, since a couple of missiles missed that easily could have hit, but it was an excellent battle from start to finish. Not a single crewmember dead, and the engine room was the only one damaged, at the very tail end of the fight. The Vulcan was just incredibly strong once it finished charging, particularly with the help of the Burst Laser + Hacking combo. I wish the flagship were always this easy! The score at the end somewhat underscores the easiness of this run because the scrap total doesn't include income gained from selling things. I picked up roughly 250 more scrap from selling stuff (like the Glaive Beam and a number of unneeded augments), and that boosted my overall scrap up to somewhere near the 2000 mark. The game is usually fairly easy to beat if you can get that kind of income, and kind of a cakewalk when you land excellent weaponry like I had here. The runs that are down around the 1500 scrap mark are the truly difficult ones. 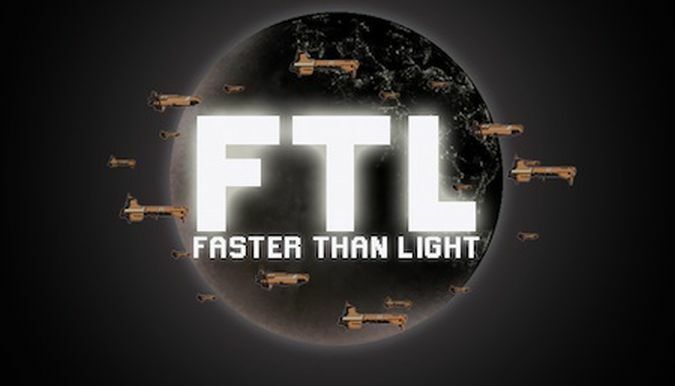 When you start to fall below that number, it becomes extremely difficult to defeat the rebel flagship. On the other end of things, I've gotten as much as 2800 scrap on Easy difficulty, which is just absurd. You literally cannot spend that much scrap! Hard difficulty is where you really have to make some tough choices since the income is so limited. I love it. Thanks for reading and/or watching this one. There's still a lot of ships to go, and the weakest ones still to be dealt with. Stay tuned.